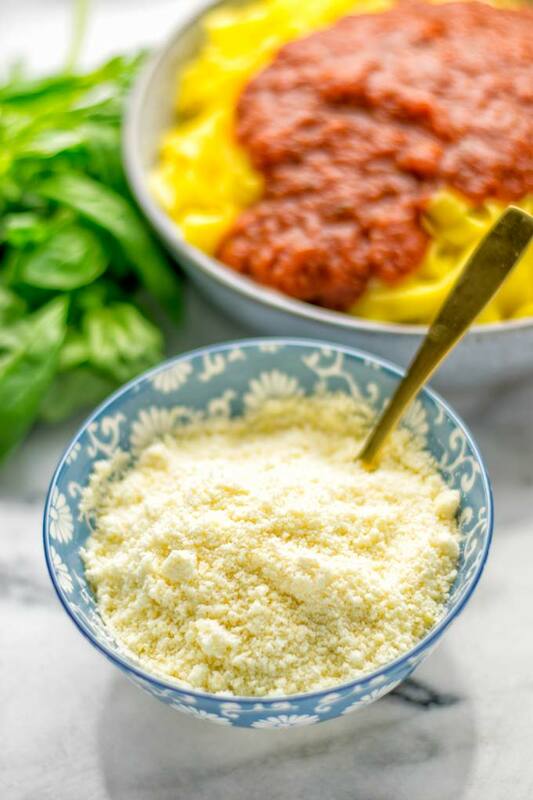 This Vegan Parmesan Cheese is such a super easy 1 minute recipe. You only need three simple ingredients: cashews, garlic, and nutritional yeast. It’s gluten free and an all time condiment – so versatile for your pastas, casseroles, pizzas or salads. Seriously the best vegan Parmesan cheese you’ve ever made or tasted. Before my vegan days I have to admit I had a big love for Parmesan cheese. Seriously it was my everyday condiment, I topped nearly everything with that. 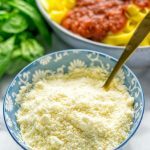 Vegan Parmesan cheese isn’t something new, but you can be sure it’s seriously the most delicious and easiest version of all you have tried. You only 3 simple ingredients, just 1 minute to make from start to finish. You can’t beat that. It’s taste wise the best flavor for no reason the garlic and the cheesy component are made for each other. Sometimes the cheesy or garlic flavor is overwhelming or not strong enough so I tested this recipe a lot back and fourth, up and down. perfectly cheesy, packed with bold flavors which make any meal better and more enjoyable, super easy, straightforward, budget friendly. Insanely versatile and seriously the condiment that you’ve been waiting for. Before my vegan days I believed as a meat eater that Parmesan was vegetarian. Only later I learned that it is not. Parmesan Cheese is made with animal rennet which is the stomach from slaughtered newly born calves. It’s obviously not suitable for vegetarians. Vegetarian Parmesan is available and made without rennet, but that also isn’t vegan or plant based. 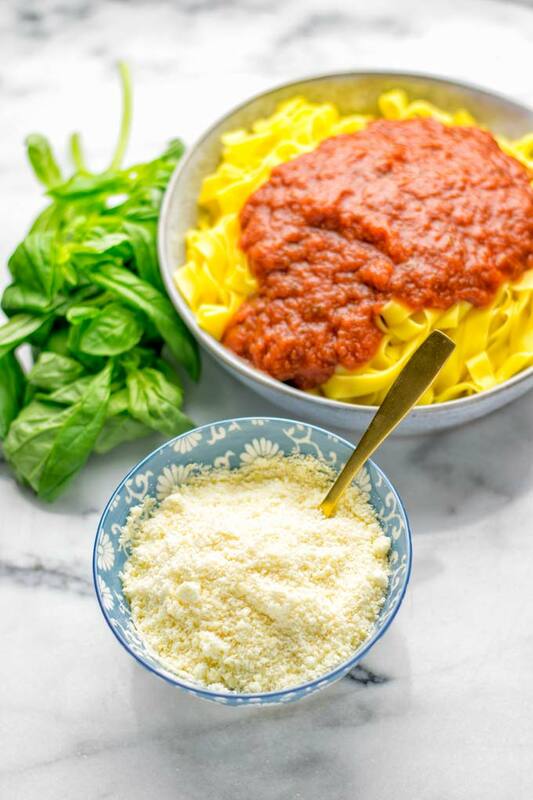 My Vegan Parmesan Cheese is made for everyone – no matter what diet you belong to – and super versatile, made with 3 simple ingredients. Nutritional yeast is yeast which is deactivated and really makes the cheesy flavor in vegan recipes. You can find it at almost every store in flakes and it’s s a great and amazing vitamin B source. 2 tablespoons of nutritional yeast provide you with 9 grams of protein including all 9 amino acids, which makes it a complete and valuable protein resource for all vegans and vegetarians. Also it’s an amazing vitamin B source because it has vitamin B12 included. Which is a thing for all vegans like me, to get enough of it. Vitamin B12 is mostly found in animal sources, so nutritional yeast is a fantastic and delicious source for vitamin B12. It’s not hard to find vegan Parmesan cheese at the store these days or online. But with it really it is with all things when it comes to food: homemade tastes so much better. I find it really not only tastes better than store bought, it is more budget friendly to make your own, too. Plus it is really made with just 3 ingredients (not counting salt): garlic powder, cashews, nutritional yeast, and a pinch of salt. It’s an amazing lactose free cheese for people that can’t have cheese which is made with lactose. First combine all the ingredients (cashews, garlic powder, nutritional yeast, season with salt) in a blender or food processor. Process until you have a flour-like texture. 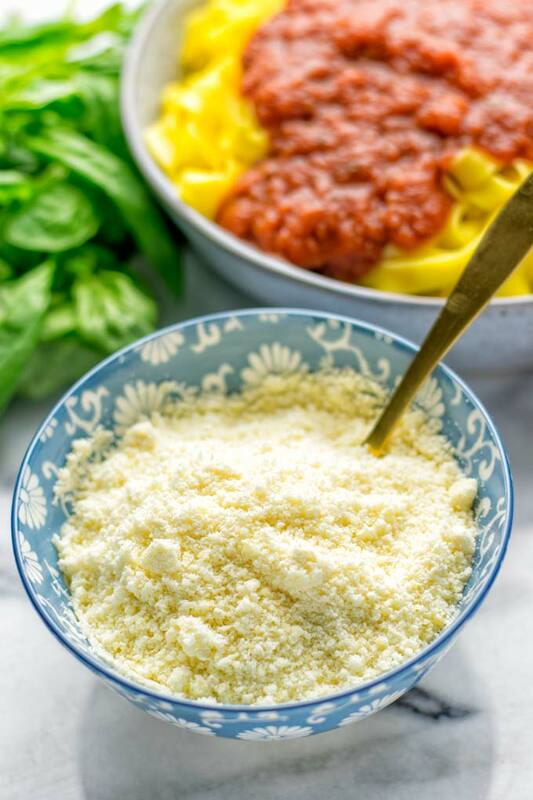 Store the Vegan Parmesan Cheese in an air tight container with lid, will keep fresh for a week. Note: A high speed blender does this in seconds. If you own an older non high speed blender model, it may take a few seconds longer. 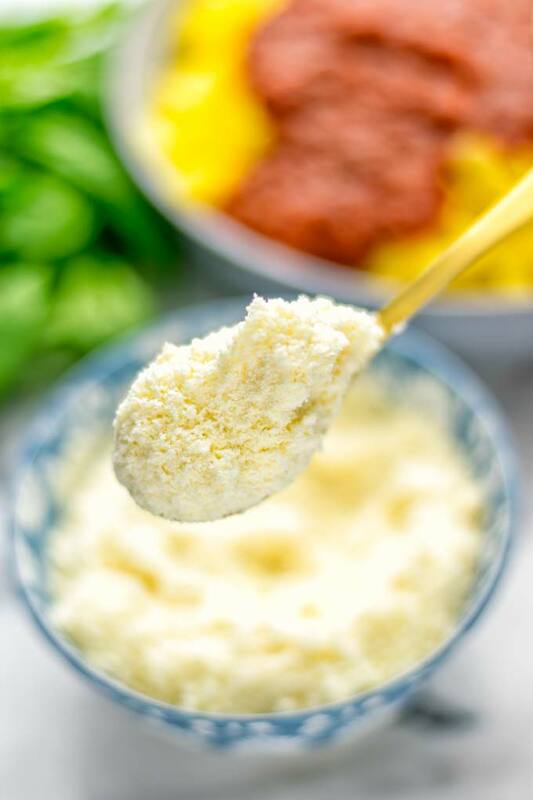 This makes such an amazing vegan Parmesan cheese which really pumps up any dish with flavor. It’s not only for pasta like this Spinach Mushroom Fettuccine Alfredo or pizza like my White Bean and Pesto Pizza. I know it also works perfectly on your salads and casseroles. Plus you can make vegan Parmesan crisps, yum, and so much more. 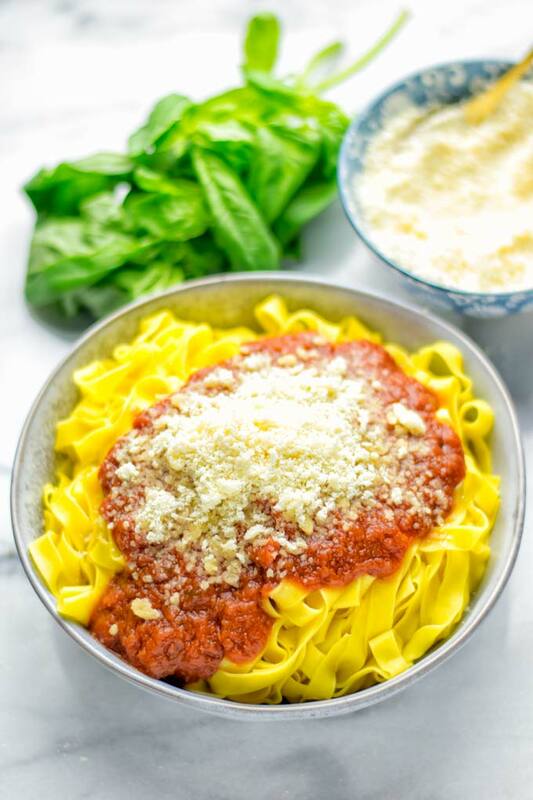 If you give Vegan Parmesan Cheese a try – seriously the best – tag me on Instagram or Facebook. 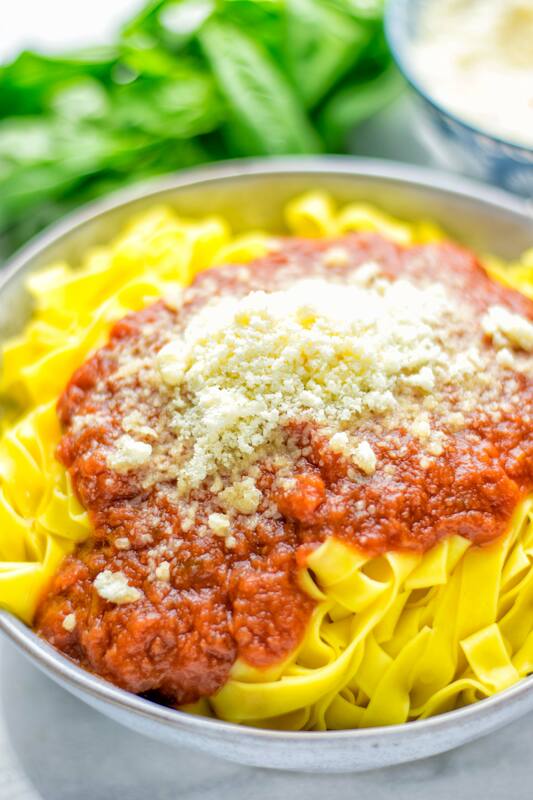 Love seeing all your pizzas, pastas and so much more topped with it. 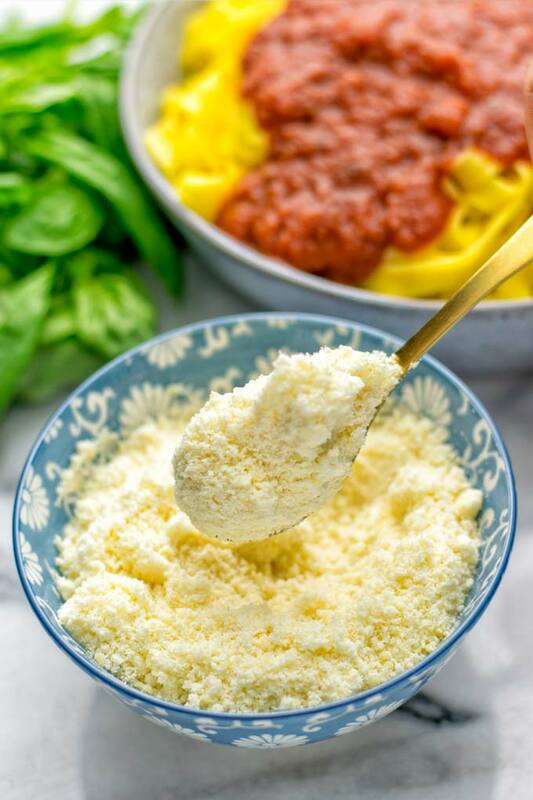 Show me a picture and simply enjoy the best vegan Parmesan cheese. Combine all the ingredients (cashews, garlic powder, nutritional yeast, season with salt) in a blender or food processor.